When Violet’s Mum married Vincent, the newly formed family had to find a bigger house. It was hard to leave the only home Violet had ever known, but that upheaval is in the past. Now Violet loves living next to her best friend, Rose. They leave little messages for each other in a secret hole in their shared backyard fence and play together every day. Life couldn’t be sweeter. Until the big news: Rose’s Dad is going to work in Japan for six weeks. He’s afraid he will forget what Rose looks like in that time, so he decides she can come too: such exciting news. At first. But then Violet starts thinking. What if Rose forgets about her friends while she is away? What if Rose forgets about Violet? Things couldn’t be more worrisome. Vincent, Violet’s stepdad has remembering troubles of his own, too: until Violet’s helpful suggestion. I love the way Anna Branford weaves such a simple, but clever life strategy into the world of everyday dilemmas and Sarah Davis’s emotion-filled illustrations always touch my heart. 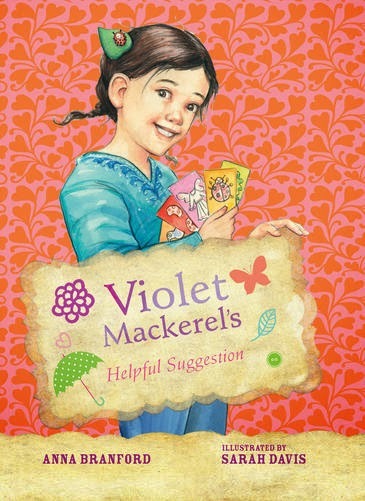 Violet Mackerel’s Helpful Suggestion is just as delightful as all the other Violet Mackerel books: another winner to whet the reading appetite of middle primary school readers. There are activities and downloads related to the series available at the Violet Mackerel website.